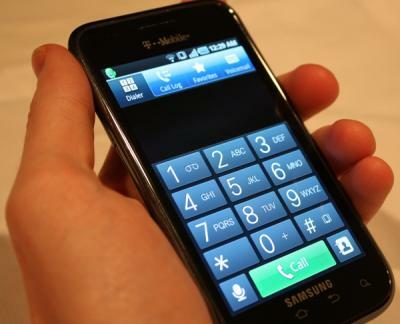 A leaked report today indicated that T-Mobile is reportedly getting ready to add another 4G smartphone to its arsenal. The new phone is the Samsung Vibrant 4G and will pack some heavy gear in terms of speed and performance. Tmonews posted a leaked screenshot that shows three new features for the upgraded Galaxy S-series device. The three features are, hold your breath, 21Mbps-capable HSPA+ speeds, a front-fancing camera ready for video chat with Qik, and a Android 2.2 (Froyo) OS. The phone itself runs on a 1GHz processor, a 4-inch Super AMOLED display, 16GB of onboard memory and a 5-megapixel rear facing camera with 720p HD video recording. 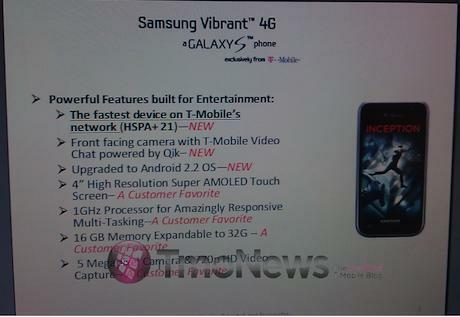 No word yet when the Samsung Vibrant 4G will be released yet.